The nights are a bit cooler. The kids are getting ready to go back to school (if they haven’t gone back already!). And Labor Day sales are around the corner. You know what that means. The end of summer is just about here. Before everyone gets back to their hectic fall schedules, why not get together with your family and friends for a few hours of food, drinks and fun? An end-of-summer party is a great way to celebrate the farewell to the season. Here are some ideas for throwing the perfect party without breaking the bank. Go potluck – Keep your party budget in check by asking everyone to bring their favorite dish, dessert or drink. 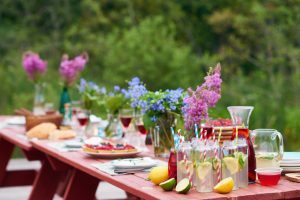 Guests often inquire about what they can contribute to a party, so this is a perfect opportunity to get everyone involved. If each person contributes one thing, chances are you will have more than enough food and refreshments for everyone. If possible, try to keep track of what people are bringing so you don’t end up with six desserts and only one main dish. Choose your retailer carefully – When it comes to sticking to your budget, where you buy things matters. Save on paper plates, cups, plastic utensils, paper goods and other party essentials by shopping at a dollar store or commissary. Also shop online or in-person at stores that offer military discounts like Shindigz, Michaels, and A.C. Moore. Don’t pay more than you have to on items that are going to probably be thrown away. Buy in bulk – Consider buying in bulk at a big box store if it makes sense. Do the math and see if buying in bulk will save you money over purchasing items individually at another retailer. If so, go for it. Just be sure not to overbuy, especially perishable food items that may go bad if they are not consumed by a certain date. Play outdoor games – Take advantage of the beautiful late summer weather by taking the fun outside. Set up a volleyball or badminton net. Bring out the soccer balls. Have a water balloon fight. Even things as simple as hopscotch, a game of hide and seek, a scavenger hunt, or a hula hoop can keep both kids and adults active, busy and laughing out loud. For even more creative ideas that will turn your lawn into party central, check out these 10 games you can create yourself. Great for all ages! Avoid themes – While it can be tempting to buy themed decorations and paper goods, it is better to purchase supplies in solid colors so that you can use any extra or reusable items for other occasions. Make a photo booth backdrop – Say cheese! Here’s a super easy photo booth backdrop you can make using plastic tablecloths. This eye-catching display will cost less than $10 and will have your party guests posing for pics for hours. Think about presentation – Sometimes it’s all about the presentation – and a fabulous presentation can cost just pennies. Serve snacks in beach pails or watermelons with popsicle sticks. If you are having a pool party, here are some ways you can get creative with labels and add some summer fun to a vegetable tray, water bottles, and soda cans. Keep it simple – One of the key ways to cut down on party costs is to keep things simple. You don’t have to have the fanciest decorations or the most elaborate foods. An end-of-summer-party is about spending quality time with your family and friends. You want your guests to remember the laughter, conversations, and fun they had at your party – and those things don’t cost a thing.